Which is the best mobile browser? My wife just bought a new Android smart phone and she wants a decent browser on it. So which is the best one? Not owning a phone myself it's not something I've really looked into. She had Opera Mobile Classic on her old one, is it still the best choice or is there something better out there now? Re: Which is the best mobile browser? On old ones (Android 2.3 in my case) Opera Mobile Classic remains the king. I have seen favourable reviews of the new Opera Mobile. This could be the most obvious place to start looking further. I don't have a newer Android myself. She has decided to give the new Opera Mobile a try, she can always remove it if she doesn't like it. I'm inclined to think Dolphin and Firefox are probably the best Android browsers if you ignore Opera Mobile Classic. I actually do use Opera Mobile because I simply don't need any better, although it can be annoyingly slow. But that kind of applies to anything other than Opera Mobile Classic. Yeah I noticed that, had a quick look in the settings to see if it could be turned off but I couldn't find anything. Though I didn't get much chance to spend time on it as my wife wanted it back. I'll prise it away from her grasp later and see if I can find any way to disable it. This past week Opera Mini has used nearly 8kB of mobile data on me, so if it did sneak in some beyond the couple of pages I loaded I suppose it's quite efficient. * My phone bill was more than 20 cents? Woe is me. But the fact that Google's own programs ignore Android's settings really annoys me. Incidentally, my phone provider is trying to get me to switch to a €10/month plan so I can get better rates. I laugh in their face and stick to what amounts to paying probably less than €10/year. That was a bit sneaky, I best tell the Mrs to watch out for that. Though her usual internet connection is via my router, so not really an issue. But there will be the odd time she'll use her mobile internet when she is out shopping. You can disable applications from using background data completely from the data usage settings. It's a pity you can't just tell it to block everything from what I can tell (besides the autosync thing). To be fair, the bill was only 50 cents data. The rest was mostly texting, which is horrendously expensive. Not expensive enough to warrant one of those "pay €5 for 200 texts" or whatever plans, naturally. I might consider paying for a good data plan, but they can keep their stupid texts besides a token dozen or so. But yeah, I use my phone to check and delete e-mails during what might otherwise be wasted time, plus then I don't have to do it at home. I've got wifi at most places where I might want to use my phone for that purpose. Think I'll have to get my hands on it and go through all the settings. Don't want it doing things unexpectedly when she's using it, or I'll never get any peace. Have you tried Maxthon browser, If I remember right its based on the IE engine but you can disable tabs in the options. may be the best solution ? Если дела идут плохо не ходи с ними. A new post in this thread after 1 year and a day! Seems to be a bit of a pattern. 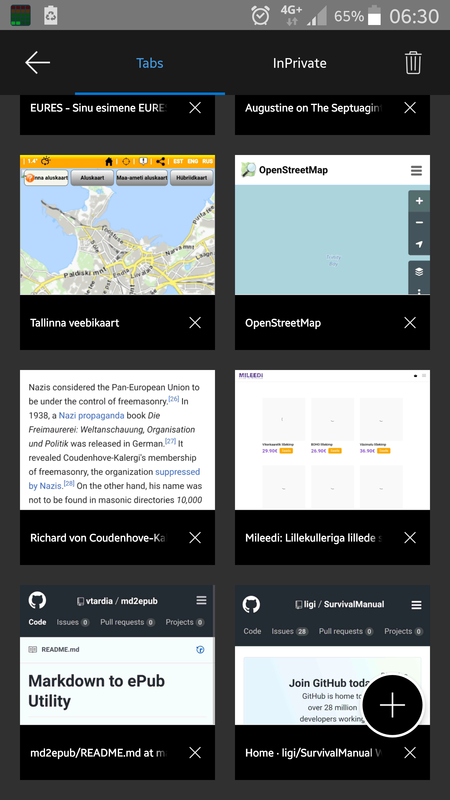 Some browsing impressions on Xperia M5. I cannot find Opera Mobile Classic in Google Store/Play anymore. I have v.12 installer stored somewhere though and maybe I will get around to installing it some day. In older Androids there was an included browser that never got any updates. In my opinion it was almost adequate, even though rather limited in options. Any other browser I tried on Android 2.3 (LG P500), they were either too fat and resource-hungry or full of annoying quirks in the interface. Opera Mobile Classic was the best. It could do wap too, natively, which I tend to expect from a mobile browser. Now in Xperia M5 (Android 5.0), the main browser is Chrome. It does its Chrome thing, connecting to every other (Google) app and presenting its own tabs as separate apps by default. Luckily I found how to keep Chrome's tabs virtually together as a single app. And I managed to switch its annoying translation suggestions off, something I never managed any other time at my reluctant encounters with Chrome. Dolphin has acquired a Night Mode, i.e. a Dark Theme. Such theme should be available across the entire device. On Xperia M5, when you turn the brightness to zero, it still blazes, and Dolphin in Night Mode is the only tolerable thing to look at. It will become my main browser on the phone. Finally there's something called Text Browser for Android. It features fine-tuning colour and font settings, scrolling with zoom button (also present in Dolphin) and, importantly, "page jump" which is a quick navigation up and down on a long page. It would be great if it were possible to set marks mid-page like in *links and w3m browsers. It has its faults too. I don't know what its rendering engine is, but it is too demanding on formatting. Then there's also Lightning browser which features a reading mode and fair colouring options, even though colouring does not apply to the reading mode. Lightning would become my favourite, if only it had scrolling by the hardware zoom button, like Dolphin and Text Browser have. Microsoft's Edge browser on Android has a good quick reading mode. It is unconfigurable, but it does everything right as far as it goes: remove videos, ads, and columns, add contrast to the text vs background (Edge opts for light text on black background). The text becomes reflowable and resizable by zooming. 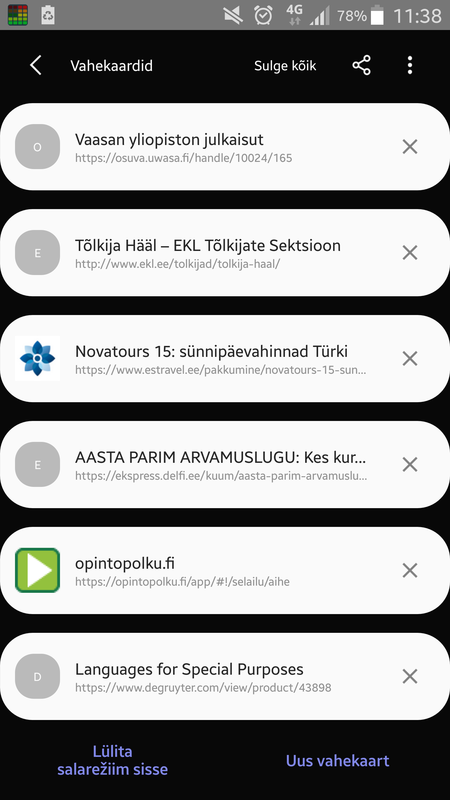 Samsung's Android browser provides more options to reading mode, such as explicit choice between light, dark, and sepia palettes, font sizes and a few font faces. Better than Edge, but Edge's options are mostly sufficient also. Opera's Android offering has taken a massive step backwards in this department. Now you can set the tabs-selection view in Samsung browser to list mode. Like this. In comparison, MS Edge on Android uses the tiles view, reminiscent of Win 8, which is a bit comfier actually on touchscreen. Everywhere else, Android uses (and Android apps use) the coverflow style to flip tabs or open apps or such. I am not too strongly against it, but it would be great to be able to configure it away to list or tiles. Page created in 0.033 seconds with 39 queries.